check this out this chap. check out how well used they are ! One day, I hope to be as fit as him. To be able to carry all that weight and walk around is no mean feat! Benny, the EF1200mm/5.6 has a handle that you can use to do lifts to train up your arm power. start off wth the 300, graduate to the 500 and after some time....u're there ! hey if u got access to a 1200mm, i also want to train my arms with it ! 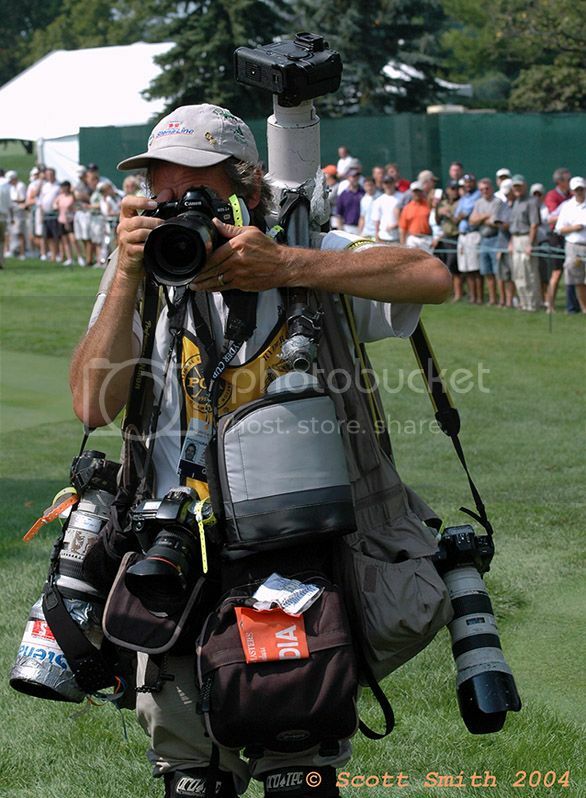 By the way, he's using the Canon EOS 1n RS!! My dream camera! the one he is "aiming" with ? Yup! One of the fastest AF cameras in the EOS series. If I remember correctly, it's 13 frames per seconds. The EOS 1v with PB-E2 is only up to 10 frames per seconds. just in case he drop on his knees with all that weight mah ! oh....isn't that the one u were telling me about ? Just imagine, in 3 seconds, an entire roll of film is gone!!! You need more time to reload than to shoot.